On the Resources page you will find worksheets and templates that will help you increase your performance and wellbeing as a project manager. There are also links to some of the webinars I have recorded. 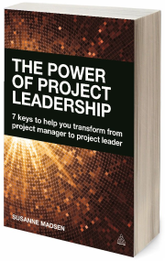 You can order The Power of Project Leadership from all leading bookstores. Click here to order and read more. The book is also available in Chinese. "Susanne's book clearly demonstrates the insights and tools to become an inspirational leader as well an intelligent manager of projects. Highly recommended. All my team have a copy. I'm that confident of the effect it will have on my business." – Paul Daniels, Managing Director, Leadership and Management Ltd.